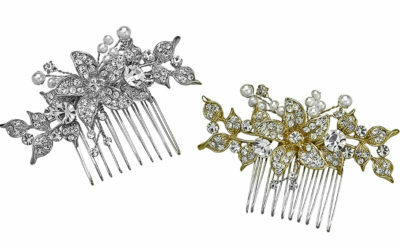 Means LOVE..we adore this gold comb with pave Swarovski crystals. It’s perfect for brides who want a dainty, sparkly accessory and also want the option to wear it again to a formal event in the future. 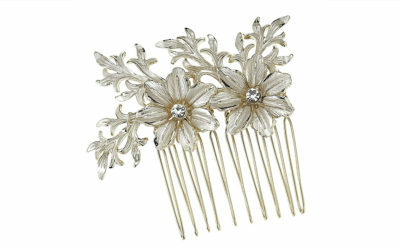 This petite golden hair clip provides a perfect balance of softness and sparkle. 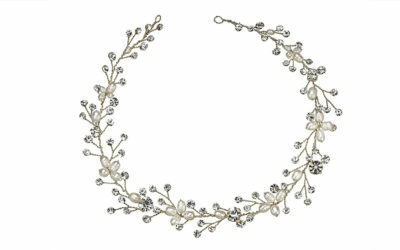 Flexible branches of Swarovski crystals, fresh water pearls and a touch of satin make this a fabulous ‘go to’ accessory for either the bride or the bridal party. 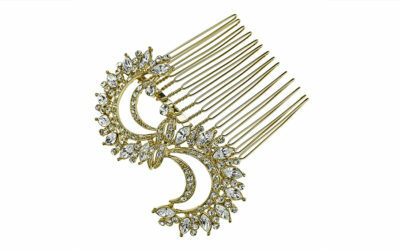 This petite comb is perfect for the bridal party in its brushed gold plating and subtle sparkle. 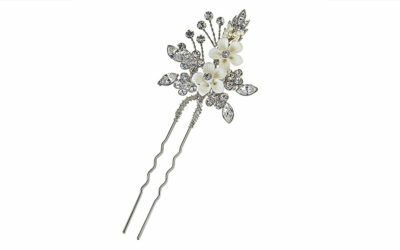 This petite comb with crystals and pearls is a perfect piece for bridesmaids or Mother of the Bride. It offers just enough radiance. 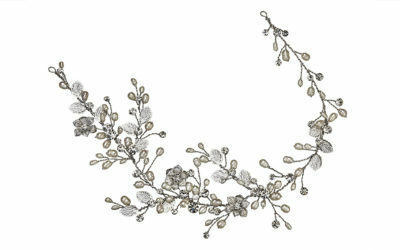 This extra long fresh water and crystal vine can be worn as a headpiece, as a belt, or a necklace. We love options! 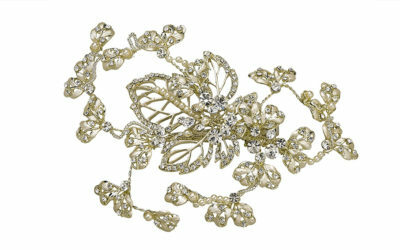 This flexible golden clip is filled with floral and leaf accents, ivory pearls, and Swarovski stones. The Italian gold mesh embraces the large crystals and offers a vintage flair. 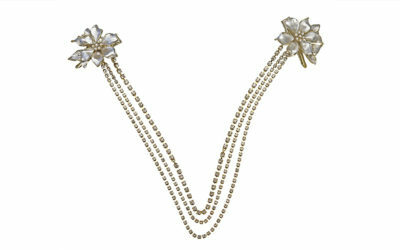 This flexible and asymmetric floral vine is awash with fresh water pearls and crystals. The options for this piece are limitless. 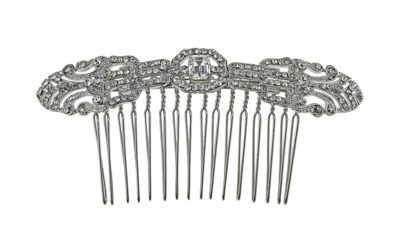 A 1920’s inspired vintage design offered in a petite pave crystal comb. An elegant accent for a Gatsby themed wedding. 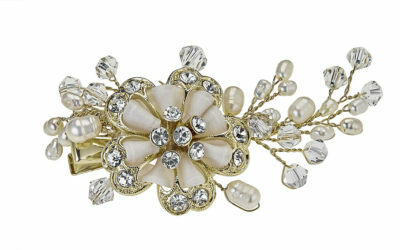 This elegant piece is comprised of pearls and clear crystals and is meant to be placed in the back of the head. There are little clips under each swag that fasten securely on each side. 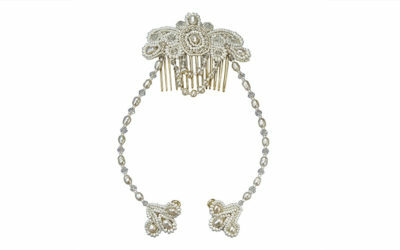 This timeless, celestial adornment can be worn either across the forehead or around the back of the head. The golden crystal swags are delicate, yet offer continuous sparkle. 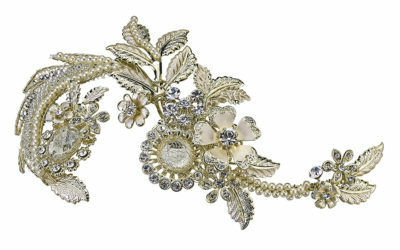 The floral clips are hand painted with a muted, silver hue.